Near Contrast testing can provide an efficient means to detect or track ocular pathologies, including glaucoma, ARMD, diabetic retinopathy, cataract, and keratoconus. 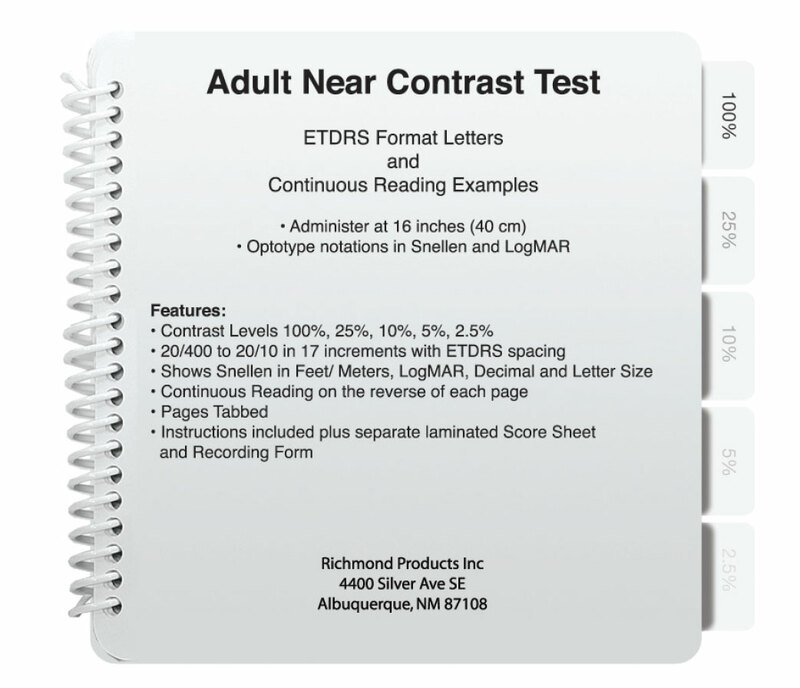 This adult near vision low contrast test features both ETDRS Format and Continuous Text in 100 percent, 25 percent, 10 percent, 5 percent, and 2.5 percent contrast level. Continuous text letter sizes range from 20/100 to 20/20 (6/30 to 6/6) equivalent in each contrast level. ETDRS format letters sizes range from 20/400 to 20/10 (6/120 to 6/3) equivalent in 17 increments for each contrast level. Each contrast level page is tabbed for easy access with included instructions. Printed on durable long lasting styrene plastic and clear coated for added protection. The near vision contrast booklet contains 7 pages measuring 6.25" x 6.25" (15.8 cm x 15.8 cm). Measures at: 16 inch, 40 cm testing distance.